Ladies and gentlemen, say hello to PIBOT. Developed in South Korea, this darling little device is about the size of a child's toy, and has a head that kind of looks like a toaster. It's also capable of flight. I don't mean in the conventional sense, either. The team of researchers responsible for the robot's development have actually managed to program it with all the knowledge and skills necessary to operate a standard civilian aircraft. Through a built-in webcam, PIBOT is able to gather information about its surroundings - including details such as location, airspeed, yaw, roll, and weather conditions. With all of this information, it's capable of making decisions in much the same way as a human pilot would. It's already completed one successful test flight - sort of. 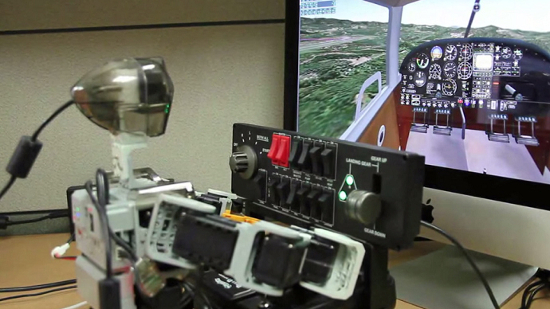 In footage presented at the IROS 2014 robotics conference in Chicago last week, PIBOT was seen guiding the aircraft through a short test flight in a flight simulator - a process which included both takeoff and landing. If you want to see the video for yourself, I've included it below. Now, it's worth mentioning that - even as awesome as PIBOT is - we aren't going to be seeing it in the cockpit of any real aircrafts at any point in the near future. Although the little robot is certainly able to operate a virtual plane, it doesn't quite possess the critical thinking skills necessary to address some of the real world situations encountered by pilots - such as inclement weather or mix-ups on the runway. It's not up to code in terms of government guidelines, either. The inventors aren't terribly discouraged, however. They expect that it's only a matter of time before they manage to get PIBOT up to the necessary standards. When the day comes, we might see airlines put to work a whole new breed of pilots; ones who never tire, never hunger, and never make mistakes. So...basically, if you've a career in aviation, it might soon be time to start planning for retirement.